I read this book in the 4th grade and still remember it. When I got a bit older I bought my own copy and have had it ever since. It is a great novel for younger readers about what it is like to escape slavery in the South in the hopes of making it to freedom in Canada. The main characters are young and the readers would be able to relate to them at least from an age stand-point. It is also a good book in general and could easily be read by older readers, too. I loved this book. Set near where I live it was first something I wanted to read because I knew the area that was being talked about. Then I actually read it and I loved it! I have even read it more than once which is a big deal for me considering I believe all the reads were after I had all ready started blogging. Her new book, The Virgin Cure, is also a good read. "It was night, and the dogs came through the trees, unleashed and howling." Mary Boulton, 19, is newly widowed, a result of having murdered her husband. The men with the dogs are her twin brothers-in-law, gunslingers bent on avenging their dead sibling. It is 1903, and the only place for Mary to run is west, into the wilderness. She is pursued not only by the vengeful twins but also by visions. Mary was raised in a genteel household but married a brute; now, having divested herself of her husband, she is not altogether sane. From an early benefactress she steals a horse, and together they navigate a gothic, ghostly mountain pass, unlikely to improve Mary's mental state. Desperate, freezing, and alone, Mary is now an outlander, as are most of the characters she encounters. The bird lady, the Ridgerunner, Bonny, the dwarf, and the cat-skinner are all earthbound beings inhabiting unsettled lives. The juxtaposition of Adamson's ethereal landscape and unusual characters make this novel difficult to put down. One is never completely sure if the landscape described is wholly real or a figment borne of Mary's fragile mind. Either way, The Outlander is a poet's journey through astonishing terrain. I can't even remember why I read this book in the first place. I think I was at the second-hand store and saw it on the shelves, so I grabbed it. I read it relatively soon afterwards and really enjoyed it. While there is a cast of secondary characters the novel is almost all about Mary. We really get to know her and Adamson does a wonderful job telling the story. It is not a happy tale, but it is worth checking out. Tom Cole, the grandson of a legendary local hero, has inherited an uncanny knack for reading the Niagara River's whims and performing daring feats of rescue at the mighty falls. And like the tumultuous meeting of the cataract's waters with the rocks below, a chance encounter between Tom and 17-year-old Bess Heath has an explosive effect. When they first meet on a trolley platform, Bess immediately recognizes the chemistry between them, and the feeling is mutual. Niagara Falls is one of the most popular tourist attractions in the world and this is one of the best books with it as a setting. If you have ever wanted to visit and just haven't made it, want a good read, or even if you have visited before and want to revisit this is the book for you. I am looking forward to Buchanan's new book next year. She is a wonderful writer! ah, Richard Wright... You did something right with this book. It is too bad I can't seem to connect with the rest of your books despite trying every time there is a new release... I really liked Nora and Clara. They came alive in this book and you got to know them really well. I enjoyed my time with them and seeing what life was like for them in the 30's. A good read! Inspired in part by real-life World War I Ojibwa hero Francis Pegahmagabow, this unblinking, impeccably researched novel is the astonishing story of two Cree snipers in the killing fields of Ypres and the Somme, and the winding journey home to northern Ontario that only one of them will make. A remarkable tale of brutality, survival, and rebirth, Three Day Road is an unforgettable reading experience. This book is obviously only set in Canada some of the time, but I had to include it. If you have ever seen the movie Windtalkers you would know of the important contribution Natives made to the war effort. This is Canada's book version. It blew me away and is one of my favourite books ever. It deserves all of the attention it received. I also recommend Anne of Green Gables by Lucy Maud Montgomery and Barometer Rising by Hugh MacLennan. They are more Canadian classics than historical fiction so that is why I am just adding them as an aside. 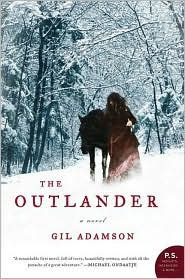 I read The Outlander a year or two ago and loved it - just couldn't put it down. I've got it sitting on my shelf waiting for a re-read. 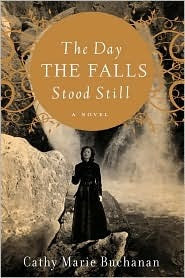 Clara Callan and The Day The Falls Stood Still sound interesting. I must out them on my TBR list. Thanks for the reviews. All new to me. Looking forward toyour reviews. I've only read "Underground to Canada" and "The Day the Falls Stood Still". Both are awesome. I can add "The Horseman's Graves" by Jaqueline Baker under the heading "Surviving on the Prairie"
I have 'The Horseman's Graves' but haven't read it yet. One day! 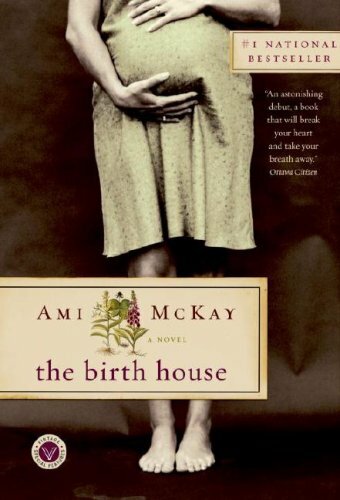 I posted a list of my favourite Canadian historical fiction on my blog on Canada Day. I'm glad to see a couple of my favourites (Three Day Road and The Day the Falls Stood Still) also made your list! Nice! I will have to go find your list. 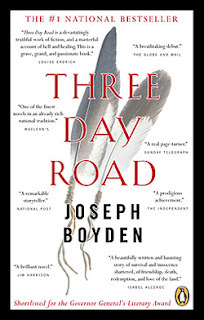 :) I am looking forward to Boyden's new book. Great list! 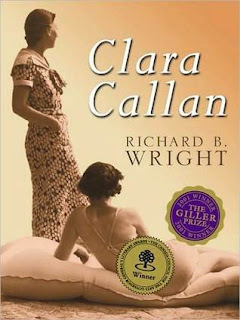 Clara Callan is a favorite of mine too. Thank you for such an interesting list Kelly. Both The Outlander and The Day The Falls Stood Still are now in my WL!